Posh manager Grant McCann issues instructions during the Doncaster game. Rovers boss Darren Ferguson is on the right. Photo: Joe Dent/theposh.com. Peterborough United manager Grant McCann admitted his team weren’t at the races today (January 1) as they dropped points to a last-minute Doncaster equaliser at the ABAX Stadium. 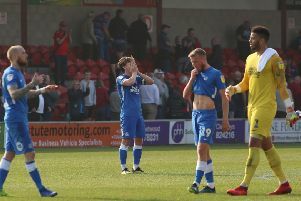 Posh looked set to scramble a scrappy 1-0 win and move back into the League One play-off places thanks to Danny Lloyd’s 10th goal of the season, but Darren Ferguson’s side finished strongly to grab a point with a 94th-minute strike. Posh star Marcus Maddison goes down under the challenge of Doncaster goalkeeper Ian Lawlor. Photo: Joe Dent/theposh.com. Posh remain eighth, two points outside the top six. They have cup games at Aston Villa on Saturday (January 6) and Luton on January 9 before returning to League One action at leaders Wigan (January 13). “We’re gutted obviously,” McCann stated. “The dressing room is more disappointed now than after losing at MK on Saturday. It’s a bitter blow for sure, but we have to be honest and say we didn’t do enough to win the game. “We weren’t really at the races. We just didn’t play. In possession we weren’t sharp enough and they played the midfield diamond really well. Having said that they didn’t threaten much until towards the end and we have cost ourselves points by switching off again. “It was a great ball to switch the attack and they managed to get two-on-one with Alex Penny as Danny Lloyd got caught too high up the pitch. We have a lot of experience, but also a lot of young lads who are still learning, but we have to do better at the end of matches. We have to cut out the silly mistakes. Referee John Brooks cautions Posh star Marcus Maddison for simulation. Photo: Joe Dent/theposh.com. “I said at the start of the Christmas programme that winning the games is all that matters. You aren’t going to play well every game, but you have to make sure you still get the result and we should have managed to do that today. “But we have played something like 18 games in 50 days. That’s a real tough schedule. It’s over now though and we can look forward to two good cup games. We can enjoy the FA Cup tie at Villa Park because we are not in a bad position in the league. We are two points outside the play-offs so we’re well in contention and it’s not been a bad points return from the busy period. McCann confirmed goalkeeper Jonathan Bond will stay at Posh beyond his original loan period which was due to end on January 3, but Reading have reserved the right to sell their player if they receive an acceptable bid in January. Bond is out of contract at Reading at the end of the season.